The dimension of the object is then 14.93 units. If a more accurate measurement is needed a micrometer screw gauge can be used. This normally has accuracy of 0.01 mm and is used to measure objects no more than a few millimetres across. The inner cylinder is graduated in mm and half mm while the rotating barrel section is graduated from 0 to 50. One turn of this will advance the jaws by 0.5 mm and so one division on the barrel is equal to 0.01 mm. 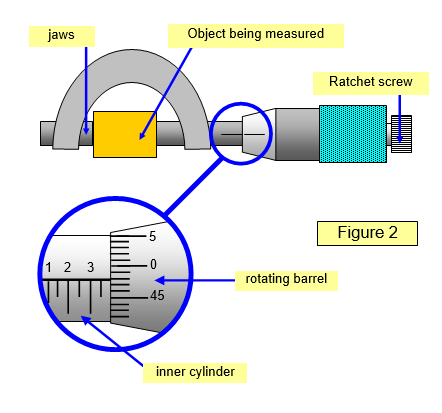 The ratchet screw should always be used when closing the jaws to avoid squashing the object being measured. In the example shown in Figure 2 the object is 3.98 mm wide.